Syria disputed the allegations, pointing to U.S. claims about Iraqi weapons prior to the 2003 invasion of Iraq. But Syria relented to an IAEA request to visit the Al-Kibar site, allowing one inspection on 23 June 2008. By the time IAEA inspectors arrived, the Syrians had bulldozed much of an adjacent hill over the reactor remains and constructed a new building on top. Despite these concealment efforts, the IAEA released a report in November revealing that a significant number of chemically processed natural uranium particles had been found during the inspection, warranting continued investigation. Agency requests to visit related sites were denied. "CIA director says Syrian nuclear reactor was nearly operational," Reuters, 29, April 2008; "North Korea and Syria: Oh what a tangled web they weave," The Economist, 1 May 2008. Leonard S. Spector and Avner Cohen, "Israel's Airstrike on Syria's Reactor: Implications for the Nonproliferation Regime," Arms Control Today, July/August 2008, www.armscontrol.org; "Syria complains to UN about Israeli airstrike," CNN, 11 September 2007. Robin Wright and Joby Warrick, "Syrians Disassembling Ruins at Site Bombed by Israel, Officials Say," The Washington Post, 19 October 2007. David Albright and Paul Brannan, "Suspect Reactor Construction Site in Eastern Syria: The Site of the September 6 Israeli Raid?" ISIS, 23 October 2007. Seymour Hersh, "A Strike in the Dark," The New Yorker, 11 February 2008. David Albright, Paul Brannan, and Jacqueline Shire, "Syria Update: Suspect Reactor Site Dismantled," ISIS, 25 October 2007; "Syria Update II: Syria Buries Foundation of Suspect Reactor Site," ISIS, 26 September 2007; "New Construction at Syrian Site," ISIS, 14 January 2008. "Background Briefing with Senior U.S. Officials on Syria's Covert Nuclear Reactor and North Korea's Involvement," Office of the Director of National Intelligence, 24 April 2008, available at the Council on Foreign Relations Website, www.cfr.org. "Syria's Covert Nuclear Reactor," CBS News, 24 April 2008, www.cbsnews.com. "Background Briefing with Senior U.S. Officials on Syria's Covert Nuclear Reactor and North Korea's Involvement," Office of the Director of National Intelligence, 24 April 2008. "Background Briefing with Senior U.S. Officials on Syria's Covert Nuclear Reactor and North Korea's Involvement," Office of the Director of National Intelligence, 24 April 2008; Jeffrey Lewis, "Revisiting Bush's Decision on Al Kibar," Arms Control Wonk, 12 September 2011, www.armscontrolwonk.com. "Syria denies N Korea nuclear link," Al Jazeera, 25 April 2007. "UN nuclear team inspects Syrian site," Reuters, 24 June 2008. Gregory L. Schulte, "Uncovering Syria's covert reactor," Carnegie Endowment for International Peace, January 2010, p.2; David Albright and Paul Brannan, "The Al Kibar Reactor: Extraordinary Camouflage, Troubling Implications," Institute for Science and international Security, 12 May 2008, http://isis-online.org. IAEA, "Implementation of the NPT Safeguards Agreement in the Syrian Arab Republic," Report by the Director General to the Board of Governors, GOV/2008/60, 19 November 2008, www.iaea.org. IAEA, "Implementation of the NPT Safeguards Agreement in the Syrian Arab Republic," Report by the Director General to the Board of Governors, GOV/2008/60, 19 November 2008, www.iaea.org; IAEA, "Implementation of the NPT Safeguards Agreement in the Syrian Arab Republic," Report by the Director General to the Board of Governors, GOV/2009/9, 19 February 2009, www.iaea.org. "Implementation of the NPT Safeguards Agreement in the Syrian Arab Republic," IAEA Board of Governors Report, 5 June 2009, www.iaea.org. IAEA, "Implementation of the NPT Safeguards Agreement in the Syrian Arab Republic," Report by the Director General to the Board of Governors, GOV/2010/11, 18 February 2010, IAEA, "Implementation of the NPT Safeguards Agreement in the Syrian Arab Republic," Report by the Director General to the Board of Governors, GOV/2011/8, 25 February 2011, www.iaea.org. 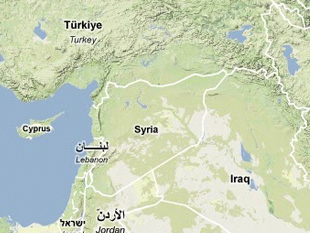 David Albright and Paul Brannan, "Satellite Image Shows Syrian Site Functionally Related to Al Kibar Reactor," ISIS, 1 December 2010, http://isis-online.org. IAEA, "Implementation of the NPT Safeguards Agreement in the Syrian Arab Republic," Resolution Adopted by the Board of Governors, GOV/2011/41, 9 June 2011, www.iaea.org.